The NOGI Spearfishing Rodeo was our big event of the year. Unlike the larger Grand Isle Tarpon Rodeo a month later, which was mainly a fishing rodeo with some added spearfishing categories, NOGI was a spearfishing rodeo with some line fishing categories. NOGI stands for New Orleans Grand Isle and was held in Grand Isle, Louisiana. Handmade from Honduran mahogany and signed by the artist, the NOGI trophies were highly coveted. The Bajaos sponsored one, and it cost us $100 back in 1964. They were beautiful works of art with sterling silver award plates. I have one, which takes me to the story of how I won it. 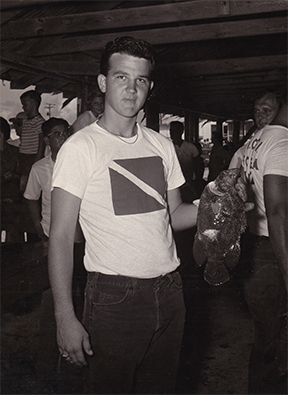 In 1964 we participated in the three-day NOGI Spearfishing Rodeo. We arrived in Grand Isle late Thursday night expecting our chartered boat to be waiting, a stripped down shrimp lugger capable of handling the dozen-plus members of the Bajaos on the trip and all our dive gear plus a compressor to fill the tanks while out in the Gulf of Mexico. No boat! It was broken down, so a scramble began to secure another boat to get out into the Gulf before dawn on Friday, the first day of the rodeo. It was late, but we dug up an oil field crew boat, 60 feet as I recall. We managed to get everyone onboard and headed out sometime after midnight. After several hours of travel and maybe an hour before dawn, we arrive at a some oil rigs. Anyone recognize these? Nope! Where are we? We had to wait for dawn to be able to read the rig’s nameplate that we tied off to. And with the dawn came the realization we were nowhere near where we thought we were. How did we get here? That is when we discovered the flashlight laying right next to the compass. A quick scan of the maps showed we were about twenty miles from Grand Isle and in over 200 feet of water. But oh, what beautiful, clear, blue water it was! We decided to stay right where we were. That turned out to be a good idea. The rig was crawling with fish: Amberjacks, Barracudas, Red Snappers, Shark, and low and behold—down on the bottom, 220 feet down on the bottom, were Warsaw Grouper, which were rare to find during the summer months. They were in the deep cold water down there and living in the crumpled and cast off steel from the rig above after it had been rebuilt twice, once burned by a fire and another when a ship hit it. 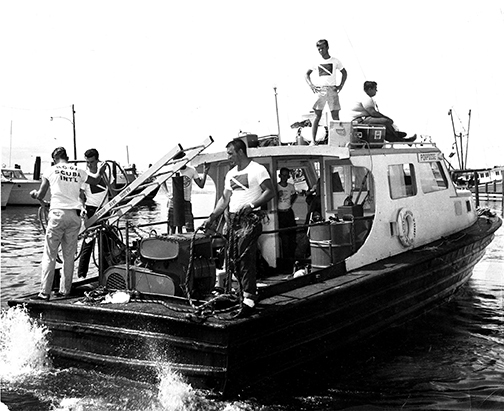 Bajaos returning on last day of NOGI on the “Porpoise.” I am second from left, third behind the ladder is Dee White, and Buck standing on the cabin. We started hauling in lots of fish—trophy winning size fish! We returned to Grand Isle that evening and weighed in with our catch. Many Bajaos went on the leader board, including me with a nice Amberjack. We told no one where we had been and went back out later that night and again the next night. We took more trophy-winning fish, but some of our fish were getting bumped by larger fish as more divers returned with their catch. I was bumped right off the board by three larger Amberjacks. Sunday rolled around, and I was off the board and getting desperate. I dived two tanks on two deep dives down as far as 180 feet with no luck. After consulting the dive tables, I decided I could make one more dive if I didn’t go very deep, but I would have to make two decompression stops to rid my body of absorbed nitrogen before surfacing if I wanted to avoid a painful helicopter evacuation to a hyperbaric chamber. I asked my buddy, Dee White, to dive with me on a fresh tank and stay well above me so I could buddy-breathe with him if I ran out of air before completing my decompression stops. I was going after the largest Amberjack I could find, and there were plenty of them still down there. I found a school passing through the rig and picked the one I thought was the largest and shot him. The spear entered his side right behind the gills, and he seemed to barely react. Amberjacks are said to be pound-for-pound the strongest fish in the ocean. I am not sure how accurate that is, but I do know they are very strong and very fast. The ones we were chasing were about 5 feet long. Because of his non-reaction, I assumed I had hit his spine and paralyzed him, so I worked my way down the cable to the spear and got right next to him. He was looking at me. Shooting them is only the beginning. You have to get them to the surface and on the boat, and that is usually after an exhausting fight that sometimes involved a wild ride through the rig. Taking them to the surface means grabbing them by the gills, actually the strip of body under the gills, and taking him up, assuming he wants to cooperate, and they often find new life part way up and drag you back down. I reached out and slipped my fingers into his gills on the far side and my thumb into his gills on the near side and grabbed him. He clamped his gill plates down on my fingers and thumb and took off like a bat out of hell! Since I was on one side of him and creating drag, that meant he went in circles with me as the hub. Round and round he went, and I am spinning like a top and wishing he would let go of my hand. Though my mask was gone, I had a death bite on the mouthpiece of my regulator to prevent it from disappearing, too. Finally, he let go of my hand and took off. I held onto the cable attached to the spear, anticipating that wild ride through the rig, but the spearhead pulled out, and he disappeared into open water. And frankly, I was glad! I located my mask on the side of my head, repositioned it over my face again, and cleared it, then made my way up to meet Dee. We made our decompression stops and returned to the boat, where Dee told me he watched the whole thing from thirty feet above and was laughing so hard at how that fish was having his way with me, that his mask filled with water. I was over my bottom time limit and risked the bends if I dived another tank, so I was done with SCUBA for the day. We left that oil rig and made one more stop at another one nearby for those with some bottom time remaining. I donned mask, fins, and snorkel, grabbed my speargun, and hit the water for one last shot at a trophy. As soon as I reached the rig, I saw a fish, feeding on the growth on the stanchion, that I had never encountered before. Its dorsal and bottom fins extended almost all the way back to its tail fin. I later found out it was called a Triple Tail. We played cat and mouse around the rig, until I got a fleeting going-away shot and nailed him. Back at the boat I was told its name, and it was a category on the NOGI board. OK, so the trophy was bigger than the fish. With everyone back onboard, and it getting close to weigh-in closing time, we headed in to Grand Isle and got there just before the scales closed. We had several fish from our boat that got on the board, including my Triple Tail, which was first place at 2 pounds 4 ounces, a smallish specimen, but the ONLY Triple Tail taken during the whole three days of the rodeo. And to top it all off, they had several drawings for $100 each. Yep, I won one of those, and that was a lot of cash for an 19 year old back then. I went home with a NOGI trophy, $100, and a great story to tell! Oh, and I never messed with amberjacks again after that. Great tale. MB would be proud. I can see Dee White laughing.